Krishna (meaning "dark" or dark-blue"), also known as Govinda ("cow-protector") among many other names, is one of the most beloved and widely worshipped of all the Hindu deities. As the central character of the immensely popular Hindu scripture called the Bhagavad Gita ("Song of God"), as well as the Bhagavata Purana text, Krishna is a colorful and polyvalent deity whose stories have greatly enriched the mythology and iconography of Hinduism. Worshipped as both an avatar ("descent" or "embodiment") of the Hindu god Vishnu, as well as a complete God in his own right, Krishna is depicted alternatively as a mischievous child, a divine lover, and a spiritual master. The legends associated with Krishna have had an enormous impact on both Hinduism and Indian culture in general, especially among the bhakti (devotional) movements of India. Today, his teachings and exploits are still widely celebrated by Hindus around the world. Many scholars believe that the varied elements associated with Krishna (lover, child, spiritual master) indicate that he is a syncretic deity. However, these elements have proven difficult for scholars to separate. One prominent theory suggests that the Krishna figure originated with the combination of two deities: Krishna-Gopala and Vasudeva-Krishna. Krishna-Gopala was likely worshiped by the nomadic Abhira clan, a group of herdsmen. From this figure come the much-loved stories of Krishna’s youth as a cowherd. Vasudeva-Krishna was likely the deity of the Vrishnis of the city of Mathura, Krishna’s supposed birthplace. Vasudeva-Krishna was worshiped for defeating the evil king Kamsa and for serving as a counselor in the battle between the Pandavas and Kauravas, described in the Hindu epic, the Mahabharata. This theory posits that the two deities merged when the Abhira herdspeople came in contact with the Vrishnis, resulting in the combining of these elements, forming the modern conceptualization of Krishna. Although Krishna is considered to be an avatar of Vishnu in modern Hinduism, some evidence suggests that Krishna and Vishnu were originally separate deities. In the Bhagavadgita, Krishna proclaims himself to be a supreme deity, rather than an incarnation of Vishnu. Additionally, Krishna appears primarily in Hindu epics such as the Mahabharata, whereas Vishnu appears primarily in the Vedas and Puranas. This suggests that initially Krishna was the deity of Kshatriyas (warrior caste) while Vishnu was worshiped by Brahmins (priestly caste), lending further evidence to their initial distinctiveness. The two deities appear to have merged during, or prior to, the fifth century C.E. The Vishnu Purana, written during this time period, is the first text to proclaim Krishna to be an avatar of Vishnu. The major sources of information about Krishna are the Mahabharata epic and its appendix, the Harivamsa, and the Puranas. The Mahabharata is one of the most important Hindu epics along with the Ramayana. Its authorship is traditionally attributed to the sage Vyasa. The Mahabharata describes the battle for supremacy between two groups, the Pandavas and Kauravas. Krishna is an important character in the epic, acting as a mediator between the two groups, and serving as Arjuna’s charioteer during the famous war between the Pandavas and Kauravas. The eighteen chapters of the sixth book of the Mahabharata contain the advice Krishna gave to Arjuna on the battlefield, which eventually formed the Bhagavadgita. During the fifth century C.E., the Harivamsa (Genealogy of Hari, another name of Vishnu) was added to the Mahabharata as an appendix, identifying Krishna as an avatar of Vishnu. The Harivamsa also contains a detailed description of Krishna’s childhood and youth. The Puranas, particularly the Bhagavata Purana, have contributed greatly to the mythology associated with Krishna’s childhood. The Bhagavata Purana outlines the avatars of Vishnu, with a large portion dedicated to Krishna. It describes Krishna’s childhood and adolescent adventures in great detail, focusing on his love for the gopis (female cowherds) in particular. The legends of Krishna are of utmost importance to the religion, art, music, and literature of India. According to Vedic astrology, Krishna is believed to have been born during the thirtieth century B.C.E. Prior to his birth, a tyrannical prince named Kamsa overthrew his father, King Ugrasena, and usurped the throne of the city of Mathura (located in the modern state of Uttar Pradesh). On the wedding day of a nobleman named Vasudeva and Kamsa’s sister, Devaki, it was prophesied that the eighth son born to Devaki would destroy Kamsa and reinstate a virtuous ruler to Mathura. Kamsa imprisoned Vasudeva and Devaki, and proceeded to murder every child of Devaki’s the moment it was born. According to Hindu legend, Vasudeva and Devaki’s seventh child, Balarama, was transferred to the womb of Rohini, Vasudeva’s first wife who resided in the cowherd village of Gokul. When their eighth child was born, Vasudeva escaped from imprisonment, carrying the infant to Gokul. Vasudeva exchanged the infant for the newborn girl of his friends Yashoda and Nanda, assuming Kamsa would not harm a female child. Although Kamsa attempted to kill the child, it slipped from his grip and ascended toward the sky. At that moment, an oracle warned Kamsa that the one who was prophesied to destroy him was still alive. Yashoda and Nanda raised Devaki’s eighth child and named him Krishna (‘dark one’). As a boy, Krishna became the darling of Gokul. Although he was constantly caught by the gopis for playing pranks and stealing butter and milk, his charm made it difficult for them to chastise him. Krishna is also believed to have performed many miracles as a boy. It is believed that Kamsa had discovered where Krishna had been hidden and sent demons in the form of animals to destroy him. The Harivamsa relates many stories of Krishna defeating demon-animals, such as Kaliya, the snake who repeatedly poisoned the village water supply, and Hastin, the mad bull. As Krishna entered his youth, he became known as a lover of the gopis. The gopis, drawn by the sound of Krishna’s famous flute, are said to have left their homes in the evenings to join Krishna in a Rasa Lila (joyful dance). During the dance, Krishna would multiply himself and dance with all the gopis, an action later interpreted to symbolize God’s complete love for each and every human being. As a deity, Krishna has been criticized for encouraging the gopis to leave their husbands to dance with him. However, some worshipers believe that Krishna should not be judged according to moral standards of human beings, as Krishna is a god, not a human. Thus, the purpose of these stories is to provide a model of devotion for Hindus: as the gopis held Krishna above all else, so too should humanity hold God above all else. One gopi in particular named Radha was extremely devoted to Krishna. 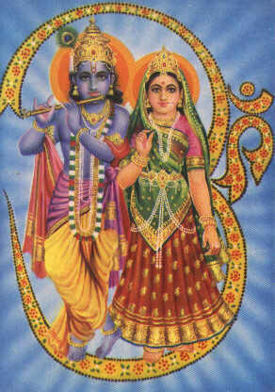 Some believers consider Radha to be an incarnation of Lakshmi, Vishnu’s consort. Radha serves as a model of complete devotion for modern believers. As a young man, Krishna fulfilled the prophecy by returning to Mathura, killing Kamsa, and returning the throne to King Ugrasena. King Jarasandha of Magadha (Kamsa’s father-in-law) attempted to attack Mathura repeatedly to avenge Kamsa’s death. For the safety of the residents of Mathura, Krishna moved the residents of the city to Dwaraka. Krishna later married Rukmini, the princess of Vidharbha, as well as several other wives. Krishna’s cousins, the Pandavas and Kauravas were at war with each other. Arjuna, the third of the five Pandava brothers and Duryodhana, the eldest Kaurava brother asked Krishna for assistance before the war began. Krishna offered Arjuna and Duryodhana a choice of either himself unarmed, or his entire army. Arjuna chose Krishna, and Duryodhana chose Krishna’s army. Although Arjuna was valorous and brave, prior to the beginning of the battle he became overcome with doubt. He turned to Krishna, who served as his charioteer, for advice. Krishna reminded Arjuna that his dharma, or duty as a warrior was to fight for righteousness, and refusing to fight would be a cowardly act. He also informed Arjuna that although people die in battle, their souls are permanent. In the Gita, Krishna outlines the different paths of the spiritual development of the soul, including worship, knowledge, meditation, and proper action. In one of the most famous chapters of the Bhagavadgita, Krishna bestows the gift of cosmic vision to Arjuna, allowing him to see Krishna’s true form. This form is described as majestic and awesome, such that it is beyond human comprehension. Arjuna describes Krishna’s true form as encompassing the sun and moon, with all the deities merging into one. Arjuna begs Krishna to return to his human form, as his divine manifestation is too difficult to behold. Arjuna prays to Krishna, and begs his forgiveness for failing to realize his divinity earlier. His faith and sense of dharma renewed, Arjuna finds the courage to fight. Eventually, the Pandavas won the battle, and virtue prevailed. Following the battle, Krishna returned to Dwaraka and lived there for many years. The residents of Dwaraka began a decline into a state of impiety and adharma (absence of dharma). Krishna felt it was time to leave his earthly body, and retired to the forest. Mistaking his foot for the mouth of a deer, a hunter shot Krishna with an arrow, and killed him. It is commonly believed that when Krishna left his earthly body, the Kali Yuga (the age lacking virtue) began. Krishna is arguably the most popular deity in the Hindu pantheon today. He is depicted in a myriad of ways, including as a child eating butter, as a youth playing his flute, and with Arjuna in his chariot. He is generally characterized as having blue skin (a common characteristic of avatars of Vishnu), a yellow dhoti (loincloth), and a peacock feather tucked into his turban or crown. Devotion to Krishna has had an enormous impact on the Indian arts. Different dance forms such as Odissi, Manipuri, and various folk dances have developed to commemorate the Rasa lila of Krishna and the gopis. Countless bhajans (devotional songs) have been composed by devotees of Krishna in various Indian languages. Krishna is also the subject of innumerable Indian paintings and sculptures, which are ubiquitous throughout India. Krishna is celebrated during many Hindu festivals. Among the most popular are Krishna Janmashtami and Gita Jayanti. Krishna Janmashtami celebrates the birth of Krishna with fasting, bathing idols of Krishna, singing, and dancing. Gita Jayanti celebrates the day Krishna spoke the words of the Bhagavadgita to Arjuna. On this day, Krishna is worshiped and philosophical debates about the Bhagavadgita are held. This page was last modified on 3 January 2017, at 23:26.